I’d like to believe that coffee lovers are open-minded people who are open to trying out new coffee brands and have an interest everything about coffee. With the latest craze on healthy living, green living and naturopathy, coffee is not exempted in this “health” war. Organic coffee became the buzz and more and more people are becoming interested with drinking organic coffee. In fact, even people who used to believe that coffee is bad for their health because it supposedly causes dehydration, heartburn and high blood had a change of heart after they found out about organic coffee. Suddenly, coffee was on the pedestal just by slapping “organic” on its label. If you think about it, is organic coffee any different from regular coffee? What are differences? What are the similarities? Is it really better to drink organic coffee than regular coffee? According to Ethical Coffee, just like any kind of coffee certification, there is a set of standards followed before any coffee produce is labeled organic. The organic seal in the United States is monitored by the U.S. Department of Agriculture. For coffee to get an organic seal, producers cannot use synthetic substances such as pesticides, herbicides and fertilizers. At least 95 percent of the coffee beans should have grown under organic conditions. Because organic coffee farmers do not use synthetic fertilizers or chemicals used in growing or production, this means cleaner beans, air, land, and water. The coffee is grown with only organic fertilizers from coffee pulp, chicken manure, or compost. Organic farms also share in fighting climate change by emitting less carbon than chemical farms. As a bonus benefit, organic coffee beans are richer in healthful antioxidants, and many people can even taste the difference. It’s not only your health that gets a boost. Mother Earth is also happy that less chemicals are used in farming. Here are some of of the strongest coffees many of which are also organic! Most organic coffee is grown the natural way. The farms are within the shade of lush forests, providing a home for wild plants and animals, sustaining soil fertility, and keeping unique regional ecosystems alive. These forested farms provide better resiliency and become equipped to handle unusual weather patterns that are a result of climate change. In the long run, these farms make a safer investment for farmers and their futures. Honduras is one of the leading producers of organic coffee. Other South American countries are also producing more and more organic coffee after Equal Exchange partnered with coffee cooperatives to restore forested lands and growing more organic coffee farms. Related – Do you have a plastic free coffee maker? Maybe you should. Let’s be clear about one thing here. Coffee is one of the most widely traded commodities in the world – second to oil. Over 12 billion pounds of coffee are produced every year. Each day over 1.6 billion cups are drunk. Every second 18,500 cups of coffee are consumed. It is not easy to meet the demand. As a result, farming methods were adapted that would double or triple the yield of production. Every acre of land used for coffee production should be maximized. However, this process comes with a price, both human and environmental. Regular, or conventional coffee, is mass-produced coffee beans. It is readily available in just about anywhere. You can find it at your local deli, in a nearby convenience store, in a vending machine and even in your cupboard, if you are someone who just grabbed a pack of coffee from the supermarket. This is the normal coffee you’d find made in a drip coffee maker served in a small carafe from your local IHOP. Nothing fancy. One important feature of regular coffee is its affordability. It’s relatively inexpensive. Why? Because regular coffee is mass-produced in the most cost-efficient ways. According to Ethical Coffee, coffee farmers who harvest regular coffee beans often use synthetic fertilizers, pesticides, fungicides and insecticides to ensure the greatest number of harvested coffee beans. Pests can easily ruin a coffee farm, but using chemicals can ensure that the coffee farm is safe from potential harm and maximum yield is guaranteed. Such a practice exposes the farmers to health hazards. The communities living near the coffee farm can also be affected by the chemical residues that mix in the air and the water resources. Because of the demand for more coffee beans, some forests are cleared to give way to fields of coffee. Coffee production may increase, but at the expense of the natural ecosystem. Natural pest-deterrents like birds and lizards lose their home. Insects that eat coffee start to populate. As a result, farmers resort to chemical solutions to protect their fields. Due to the inevitable climate change that follows this sort of ecosystem change, rains increase the water runoff in areas where the forests were cleared. Soil is washed away, along with its nutrients. The rainwater also carries away the chemicals sprayed on the coffee trees, which poisons water sources. Is it Better to Drink Organic Coffee? 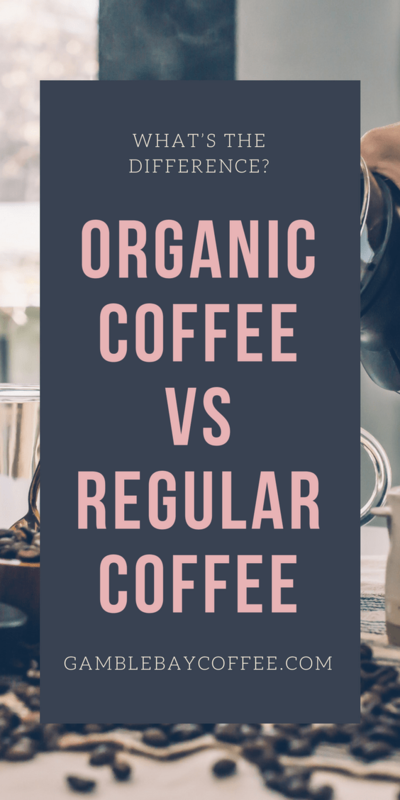 No matter if you drink plain drip coffee or make fancy coffee in a french press travel mug, you can consider two things when deciding to drink organic coffee. Organic coffee is arguably better than regular coffee, because they are produced without the potentially harmful and lethal chemicals. Also, organic coffee preserves more of the antioxidants present in coffee beans. If you want to get the best out of coffee for your health, going organic is the best option. You get more caffeine and more beneficial antioxidants that help fight aging, promote weight loss and prevent the risk of developing cancer, heart disease, liver problems, Alzheimer’s and Parkinson’s diseases. If you want to contribute to fighting climate change, patronizing organic coffee is the way to go. This way, you encourage coffee farmers by your support as you buy their products. Organic coffee thrives in the shade under the lush canopy of thick, tropical forests. In other words, forests don’t need to be slashed and burned to make room for organic coffee crops, because natural coffee grows better in those woodlands anyway. Regular coffee, meanwhile, is usually grown on large sprawling farms that were once forested. Should you Buy Organic Coffee and Forget About Regular Coffee? If price is your main concern when buying coffee, your choice will gravitate toward buying regular coffee. It is really affordable and it gives you the caffeine fix you need on a daily basis. You still get the same antioxidants, but along with it, you can just imagine how many chemicals are used in growing these coffee beans. However, if price is not an issue, go for organic coffee. It is consistently found in all of the best local roasteries and if you are making espresso at home then you’ll find the best espresso coffee beans are almost always organic. Many people are disappointed by the expensive price tag of most organic coffee. However, in time, the price will also go down as more coffee farmers opt for organic farming. To date, organic coffee is about 3 percent of the total coffee production. It’s a small number, hence the price is highly dictated by the producers. But as the law of demand and supply dictates, an increase in demand of organic coffee will encourage non-organic coffee farmers to have a shift and go for organic coffee production. If you have not tried drinking organic coffee, now is the time to give it a go. I want to also encourage you to try different brewing techniques too. If you are going to splurge on more expensive organic coffee beans then get yourself a large moka pot and a wide bottom travel mug to savor your fancy cup of Joe in style!